Stretching three miles from east to west, Adams Avenue spans at least four neighborhoods and crosses two major freeways in a central part of San Diego. 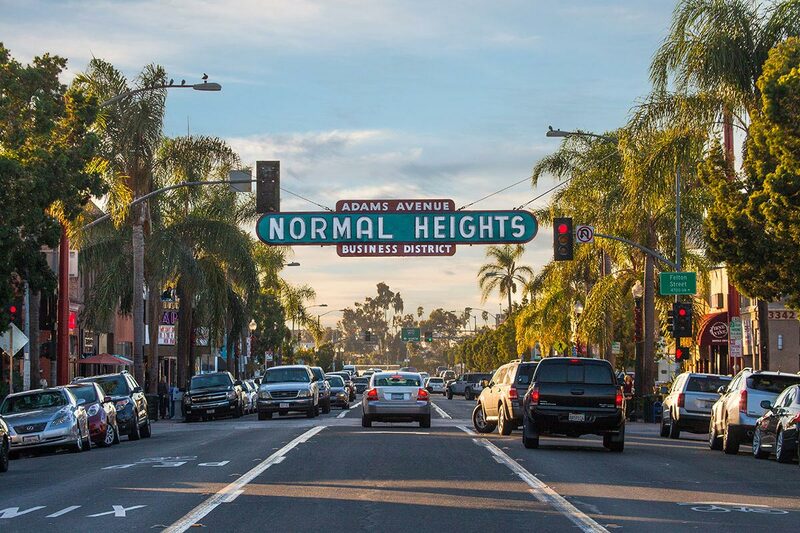 Lined with historic Craftsman houses and populated by young families and the artsy millennial crowd, it offers an impressive lineup of hip eateries, boutiques, and bars. Start in the middle or work your way from one end to the other – you can’t really go wrong in this hipster-friendly ‘hood. Customize your own meatball meal via sub, slider, or spaghetti, and rinse it down with a creative craft cocktail from the next door speakeasy. San Diego is experiencing a ramen boom, and Tajima is leading the charge. The Normal Heights location offers bowls for all different tastes and diets, like a delicious vegan ramen with spinach noodles. Dark Horse has taken the local craft coffee scene to the next level with its Hawaiian-inspired small-batch roasts and cold brew growlers. This is where you’ll find San Diego’s top bartenders drinking on their day off. The 70s-inspired bar has a menu of artisanal cocktails and liquors, plus occasional live bands. Get your craft beer with a side of pizza at this casual, vegan-friendly brewpub. Also worth a visit? BLAH’s sister restaurants Tiger!Tiger! in North Park and Panama 66 in Balboa Park. Still a relative newcomer on the San Diego beer scene, this female-owned brewery is outfitted with a World War II theme and offers a varied lineup of house-made beers. Take your pasta-eating experiences to new heights at the latest addition to Urban Kitchen Group’s already-impressive roster of Italian eateries. This small neighborhood brewery didn’t actually have a tasting room in Kensington until fairly recently when it moved into a former video store. For a real flavor bomb, try the Apricot Wheat. Kensington’s original family-owned brewpub keeps plenty of beers on tap and boasts actor Will Ferrell’s seal of approval. For a beer to go, Clem’s Bottle House next door offers a wide selection of bottles. Stocked with chic indie brands such as Laura Lombardi jewelry and Charlotte Stone shoes, Maven features carefully curated lifestyle products perfect for souveniers and gift giving. Formerly known as Niche, this Kensington shop combines Japanese and Swedish-inspired design, unique gifts, and even a monthly subscription box program. Located next door to always-open coffee shop Lestat’s in the heart of Normal Heights, this music venue hosts regular shows, open mic events, and comedy nights. This neighborhood dive bar and venue has two parts: a bar area with seating and a pool table, and a separate room for concerts. Check it out for eclectic local San Diego bands, karaoke, and cheap drinks. This Normal Heights nonprofit promotes creative re-use by hosting art education workshops where discarded items are transformed into art. Browse a colorful collection of folk art and handmade gifts from around the globe, or attend one of the shop’s many DIY workshops. Southern California’s largest free two-day music festival has been taking over Adams Avenue for a weekend in September for the past 36 years. This free musical walkabout features live music staged at different locations throughout a two-mile stretch of Adams Avenue during the last weekend of April each year. Wear loose-fitting pants to this annual tasting event featuring bites from over 40 of the area’s hottest eateries, cafés, breweries, and bars.